This second version of GBIF Soundscape builds upon our previous entry through a redesigned user interface. Users can now build their own soundscapes by adding and removing taxa through the site. Users can also generate soundscapes based on location, type of organism (bird or frog) and season (winter or summer). We have also included additional localities. Our strategy instead is to use a general occurrence search to discover the taxa that are present in our region of interest, and then a secondary search for sound files for those same taxa (regardless of location). These media will almost certainly have been recorded at locations other than our region of interest, but in the same way images are used across different localities, we assume that a given species makes the same sounds worldwide — note that this might not necessarily always be the case. For data-rich regions, we can apply additional filters according to the attributes of the data — for example, by time of year, allowing seasonally-varying results. We investigated using time of day, but found that it did not give consistent results. The processed data are summarised into a JSON-formatted file to be used by the web interface, including the appropriate citation details for each image and audio file. We have used a local cache of images and sounds to avoid latency and cross-site request issues with media files. The user can add up to 20 taxa to the soundscape, so as not to turn the soundscape into an overwhelming racket. This also helps to avoid crashing the browser, which seems to be a risk when playing many audio files at once. A copy of the interface has been included in the submission. Use Firefox if running from a local copy: Chrome doesn't allow access to local json files with Ajax. The live version of the web interface can be accessed here, and the source code is available. Some sound media contain human voices, which strongly detract from the overall results. We excluded such audio clips here by avoiding all media from any provider that tended to have voices present — rather a brutal approach! We could have removed the first part of the sound file, when voices are usually present, or a more elegant solution would be to use some digital signal processing to identify periods of unwanted sounds (e.g. human voices, traffic noise). Periods of silence could also be removed, reducing long recordings down to shorter snippets of still-relevant audio. The demonstration interface provides sounds and images for a number of pre-computed regions. 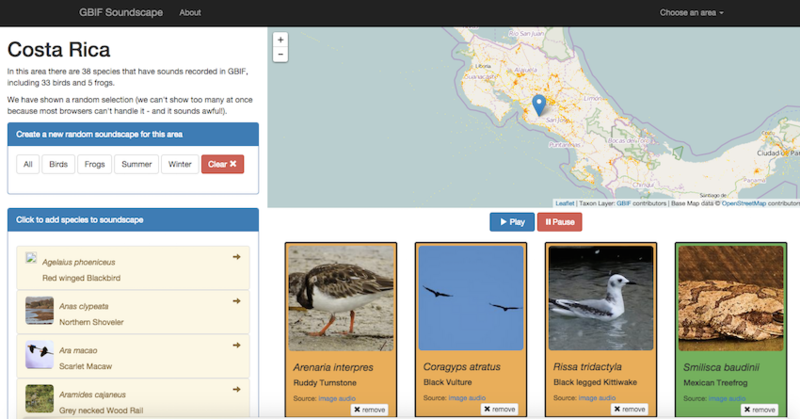 We explored the option of allowing the user to select an arbitrary region of interest, however the the GBIF API does not provide a way to efficiently extract a species list in an arbitrary region of interest, and so this is not currently a practical option. It's worth noting that, at the time of writing, other sound media were available through GBIF, but were not returned when the mediatype was specified. This was due to the required metadata not being recorded in the source. This is being followed up by the GBIF team.